SENIOR MOMENTS: Around the Table with John Korty and Lope Yap Jr.
You are at:Home»English»Columnists»SENIOR MOMENTS: Around the Table with John Korty and Lope Yap Jr.
John Korty was the director and Lope Yap, Jr. was the production manager for the film version of “Farewell to Manzanar.” Castle Rock is the distinctive landmark of the Tule Lake incarceration site, which served as the primary filming location for the movie. “Farewell to Manzanar,” a story by Jeanne Wakatsuki Houston about one family’s incarceration at Manzanar during World War II, was produced for national television in 1976 and made into DVD form in 2011. John Korty and Lope Yap Jr. Please note that dozens of pictures taken on location at Tule Lake by the late Barbara Parker Narita, the wife of the cinematographer for “Farewell to Manzanar,” Hiro Narita, should be available on the Densho website at the end of the summer. As a Sansei-Gosei, I (Laurie) am very interested in the wartime stories from my parents, grandparents and elders. Growing up, the stories did not flow freely. I’ve observed that Japanese Americans are not, by and large, a story-telling type of people with a rich oral history. So I’ve learned my family history through Asian American studies classes and bits and pieces of writings, films and personal accounts by relatives, friends, and clients. That’s where Martha Bridegam, one of the authors of this column and the Discover Nikkei column, comes in. For almost two decades, she has had a keen interest in the history of Tule Lake. Martha first visited Tule Lake when she was a law student researching advocacy needs of migrant farm laborers. She didn’t even realize that the farmworkers’ housing she had visited was on an incarceration site until she went to the Japanese American National Museum and saw a display on Tule Lake. 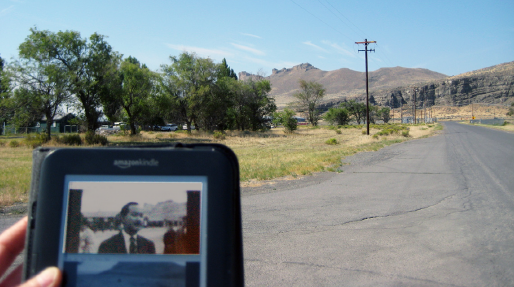 Castle Rock, visible in the distance, is Tule Lake’s most prominent landmark. She’s been inspired to interview people, do historical research, and work on a book project about Tule Lake. She has participated in several Tule Lake Pilgrimages. Writer Martha Nakagawa has published several articles in The Rafu on the pilgrimages and the 2009 dedication of the Tule Lake camp site’s core as part of the World War II Valor in the Pacific National Monument: See www.nps.gov/tule/learn/news/upload/rafu.pdf and www.rafu.com/2012/07/interest-growing-in-tule-lake-story/. 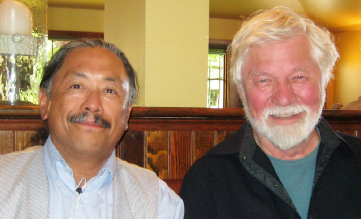 When we called John, he agreed to meet us at Point Reyes Station. He surprised us by bringing Lope with him. It was extremely interesting to be part of a conversation about “Farewell to Manzanar” and Tule Lake, topics central to the history of my people, with folks with different family histories than my own. If you haven’t seen the DVD yet, it’s worth seeing for the bus arrival scene alone. (Order information at the Japanese American National Museum store: http://janmstore.com/products/farewell-to-manzanar-dvd) As we discuss in Part 2 of the article, the late Yuki Shimoda (playing father Ko Wakatsuki) had in fact been incarcerated at Tule Lake. The first time he returned was when he arrived for the movie shoot, with the cameras rolling. He saw the familiar Castle Rock mountain formation as he stepped out of the bus and his face was overcome with emotion. The Nikkei extras in the movie came to Tule Lake with a sense of purpose. As we discuss in Part 3 of the article, of course it was more than for the money. People would not go to the remote destination unless they wanted to be there. Many extras had themselves been incarcerated, and tears were shed as people lived or relived the camp experience. Writing the article has made me focus on Tule Lake. I didn’t realize that almost one-tenth of the total population of Japanese Americans were incarcerated at Tule Lake. Family and personal divisions caused by the loyalty questionnaires, uprooting to Tule Lake, and repatriation to Japan are still a live issue in our community. I’m glad that the DVD is finally available. (See JANM order information above.) Our mass incarceration happened three generations ago, the filming took place almost two generations ago, but retelling and remembering our story is still important. I had my teenage son watch the DVD. He’s like, “Yeah, it was a tragedy but there are a lot of other tragedies and it happened a long time ago.” But it’s my grandparents’ and parents’ story, so it’s my story too and it’s affected our attitudes, perceptions and group psyche in profound ways. It’s encouraging that so many young people went to the Manzanar Pilgrimage a few weeks ago. I’ll try to tell my son and his generation what happened and how it affected their people because he/they will eventually see the significance. Laurie Shigekuni is the principal attorney at the law office of Laurie Shigekuni & Associates, a firm that practices estate planning, trust administration, probate, elder law and Medi-Cal long term care law. Her lifelong interest in Nikkei issues has been influenced by the activism of her father, Phillip Shigekuni, who was instrumental in the redress movement, and the community leadership of her aunt, Akemi Kikumura Yano, a founder of Discover Nikkei and the former executive director of the Japanese American National Museum. She is a guest writer for the “Senior Moments” column in The Rafu Shimpo and a former contributing columnist for The Hokubei Mainichi. Martha Bridegam is a lawyer and freelance writer in San Francisco. For several years she was a part-time estate planning attorney with the law office of Laurie Shigekuni & Associates. She first visited the Tule Lake Segregation Center site in 1993 as an intern with a legal aid office and has returned since then to research the history and context of the site. Her website is at marthabridegam.com.